Well I thought yesterday's pinks were great colours but I'm loving this bluey/green Sassy! Loving the lace as well (where did you get it from?) and I like the loops around the edge of the image. Thanks for the kind comment on my blog. Hi Sassy oh I love this gorgeous sweet image, the colour combo is stunning fab creation for middle of the nite..lol am not a good sleeper meself at mo..
Oooh beautiful card Sassy! I know what you mean about bad eyesight - as for me I can't see with my glasses and I can't see without them! When reading small print I have to have to take glasses off, hold paper so it's touching my nose and have eye closed too! What a pretty picture - lol. Still, we get by don't we - case of having too! Hope you managed to stay awake! Another beautiful card with this image, I like the colour, the lace and the ribbon. Omg what are you like, i was well snoring at that time in the morning. 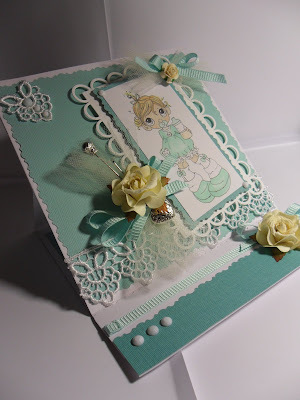 Gorgeous card, sweet image and lovely colours.